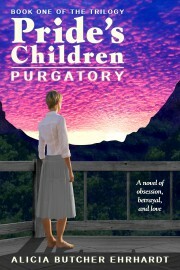 Pride’s Children is on Kindle Countdown SALE at 0.99, US and UK! For new followers – if you’ve liked my writing, here’s a chance to try my long-form fiction. WARNING: not everyone likes it. Here are the links to go directly to the Amazon US and Amazon UK sites. This entry was posted in Epublishing, Reading and reviewing and tagged Pride's Children, SALE on June 25, 2016 by Alicia Butcher Ehrhardt.